Are you looking for the best payment plugins to accept the payments for your website? You are the right place, in this post, we will list a collection of best-handpicked Stripe payment plugins for WordPress website. Everyone will be wondering what is the term Stripe and how can we use it to accept payments?. Stripe is actually a third party payment processor company that makes it easy for companies to do business online. It allows you to accept payments directly onsite and has an option to accept Payment Requests, SEPA, and much more payments methods. It lets the customers to easily pay using their credit card or debit card without any inconvenience. Stripe payment is amazing for all type of business. Stripe comes with wonderful pricing, 24/7 customer support, game-changing features and much more. It is actually similar to PayPal but more secure and comes with plenty of user-friendly tools. It makes the payment process very easy for customers without loading additional pages, so customers will be satisfied and need not wait for a long time to make their payment. That brings a good impression on your website. It has very impressive features and you can set up the Stripe very easily. This platform supports all most all credit and debit cards over 100 currencies as well as payments from Alipay, Bitcoin etc. Whatever your business is, the Stripe is the most suitable payment gateway. You will be charged around 2.9% +30 cents for each payment. It is more reasonable compared to other payment gateway methods. Overall it is very easy to integrate and offers a great user experience as long as you choose the correct Stripe payment plugin. 1 Why Stripe for WordPress? 2 How to create a Stripe account? Stripe is a straightforward payment solution where it reduces the task process simple both for the customers as well as for you. To integrate Stripe with WordPress initially you need a Stripe account and then Stripe insists you to use an SSL certificate on your website to accept payments. Once the activation form is completed, click the “Activate account” button. That’s it, you Stripe account to be activated and you can make use of it. There are dozens of Stripe payment plugins available. But choosing the right one will be a hectic task and you may want to spend much of the time with it. To reduce your burden we have listed the best Stripe payment plugins, You can choose them as per your wish. WP Simple Pay Pro is one of the super cool and simple Stripe plugins that is used all over the world by many companies. It lets the website owners accept one-time and recurring payments. It comes as first in the list because of its active number of installs. It allows you to accept payments on your website using Stripe without even adding any additional shopping cart plugin for your website. You can create any number of payment forms with a Stripe payment button. In the payment form, you can add all the required fields. In case if you wish to create a beautiful pricing page then you can use easy pricing tables plugin along with this plugin. Through Stripe you can collect payments for services, single products, donations etc form your website. The payment information will be stored on the Stripe website so that your database is not loaded with huge stuff and helps your website load faster. With the help of this plugin, you can even add coupon codes for discounts and custom fields to capture more information from users. This plugin is translation ready and supports nearly 12 languages, 25 countries, and 135+ currencies in Stripe. You can even customize the Stripe checkout screen by your logo and any personalized button text. If you are not satisfied with the plugin, they give a 100% refund within 30 days. WooCommerce is one of the free and most powerful eCommerce solutions for WordPress website, with its free extension, it lets you collect payment directly on the website through Stripe payment gateway. This plugin enables you to sell physical goods, digital downloads, subscription courses, membership etc. It nearly has 48 million active installs. An additional advantage for iOS users is that it support for Apple Pay. While configuring the WooCommerce plugin it allows you to choose the payment providers, by default it gives you to select either PayPal or Stripe. Even at the time of configuring you missed choosing Stripe, then you can just install and activate the free Stripe for WooCommerce addon. In the repository, you can find hundreds of free as well as premium WooCoomerce extensions that let you include enhanced features to your website. This plugin lets you accept payments from Debit card, Credit card, Bitcoin, Alipay, and Apple pay via Stripe gateway. With the help of this plugin, you can create a wonderful website with easy acceptable payments. In case if you are already using WooCommerce plugin, then you an addon the Stripe payment gateway extension. It lets you easily accept payments with no much time. By adding the Stripe payment request button you can check out the process easily and quickly right away from the product page or cart page. The Stripe customers can save the card details on your website which is fully secured and safe. It gives you a smooth interaction between your website and strip account. You can include any number of hooks and filters that are required for your website. You can download the extensions for free of cost from the official repository. 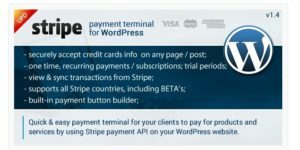 Stripe payments are one of the free Stripe payment plugins that are available in the WordPress repository. This plugin lets you accept credit cards payments easily through Stripe gateway. You can easily add a buy now button on your website with a shortcode. You can then customize the buttons using CSS. This plugin is very responsive and compatible with all the devices. All the transaction information will be captured in the order menu and you can view all the payments received from your WordPress admin dashboard. You can set up the Stripe payments in two ways either by configuring the product page from your dashboard or by using the shortcodes. It sends an email notification to the customers who made their transaction and customize the checkout results. Though the plugin is free, it gives you many features and full control to collect the payments via Stripe without any difficulties. You can accept payments from the customers for buying products as well as for donations. You also have a remember me feature that lets the customers easy buy the products again and again. It gives a one-click checkout for the customers where they find it very easy and effective. You can download this plugin for free from the official WordPress repository. WP Full Stripe is yet another powerful Stripe plugin. This plugin lets you accept payments easily and create subscriptions from your WordPress website. With the help of this plugin, you can embed the payments forms in any post or page and takes payments directly from your website without directing it to any other page or website. This plugin is compatible with any WordPress themes and you can style the forms as per your wish. This plugin supports multiple languages and also supports Stripe in Australia, Austria, Canada, France, Belgium, Finland, Denmark, Japan, Sweden, Italy, Germany, Hong Kong, Ireland, Netherlands, Portugal, Spain, Singapore, UK, US, Luxembourg, Norway, Spain, Switzerland and preview versions in India, Brazil, and Mexico. This plugin is compatible with WordPress 4.0.0+ and with the latest version 4.9.8. Lets you incorporate shipping address forms, subscription popup button, language selection, multiple payment forms into one page, and payment security. You can get the regular license for $39 per year and the extended license cost of $184 per year. Easy Digital Downloads is yet another powerful eCommerce plugin that lets you sell digital goods from your website. This plugin by default comes with PayPal, test payment, and Amazon pay gateway. If you want to add Stripe, then it is a paid add-on extension. Along with the right extensions, you can make wonderful use of this plugin. This plugin is simple to accept credit cards directly on your website. It doesn’t allow the users to redirect to any page while payment is processing. It includes complete support for the recurring payments extension, allowing you to create and process recurring subscriptions for customers. All the card information is stored in Stripe and the logged in customers can select the used cards during the process of checkout, so they don’t have to enter the card details again and again. The extension cost for a single website is $89, for up to 5 websites it is $129, and for unlimited websites, it is $209. Stripe Payment Terminal WordPress plugin is one of the most cheapest Stripe payment plugins. This plugin simplifies the way to accept the payments and subscriptions on your WordPress website. With this plugin, you can create multiple buttons for payments and you can place it anywhere on your website. It also lets you create products that offer a free trial. Easy plugin for accepting credit card payments. This plugin has a pre-set 42 button designs for you to choose from, or you can use the button generator and create a button as you wish. It has an inbuilt 369 FontAwesome icons which can be used on the buttons. One notable feature is that “Sync from Stripe” option. For example, a customer has subscribed to monthly payments through this plugin. Then the next customer charge won’t be visible in your application, but by adding “Sync from Stripe” lets you easily load the last 100 transactions which are not in the app database. By this option, you will be able to have all customers recurring charges in one place. This plugin is yet to come with more features. It comes with a cost of $21 with 6 months of support. You can extend the support time by paying an additional charge of $6.38. Payment plays an important role in any online business. Just through the payment gateway, you can easily sell your goods and at the same time lets the customer do transactions easily. Just through a proper payment gateway, it builds trust in your business and customers will be satisfied. In that case, the Stripe payment gateway takes a head and manages the payment without any difficulties. Hope you got an idea about the best Stripe payment plugins for WordPress. If you come across some other best plugins, please do mention so that it will be helpful for the upcoming readers. If you have any queries feel free to comment to us. You can subscribe to us at Facebook and Twitter. How to Add a Click to Call Button in WordPress?